Home » Product Reviews » Knock me down with a feather! Clarins Shaping Facial Lift Serum works! Knock me down with a feather! Clarins Shaping Facial Lift Serum works! As a kid I was called “Moon-face” in school. Kids are horrible cruel creatures. But I’ve always had a round face. If my genetics are anything to go by (just look at your parents) I’m going to end up still with a broad round face, but with jowls. 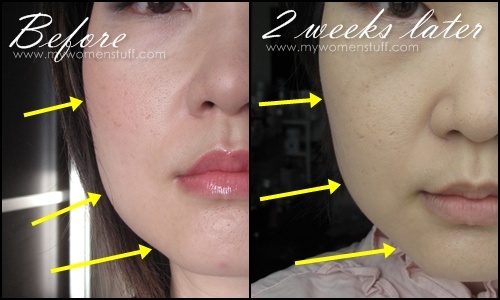 So as I started trying out the Clarins Shaping Facial Lift Serum, I targeted those dreaded jowls I was developing. Gravity is cruel. Now the ad talks about creating a V shape for your face. Yes its ideal but I’m going to tell you to be realistic and understand your face structure. If your structure is not predisposed to a V shape, no cream in the world can give you that. Plastic surgery might though. So in my case, I have a roundish face but squarish jawline. My sole target was to reduce the pockets around my jawline as it makes my face look “heavy”. Well, knock me down with a feather! This face sculpting serum helps! Some pictures follow below. I was told that this serum is an Asia only product. It has been around for a while, but this is a new formula. According to Clarins, Asians are genetically prone to having more fat pockets on our face. It keeps us looking young for longer but it can also make us look puffy and “heavy” if we aren’t careful, and as we age. With our poor diets, stress, pollution and poor circulation, we find ourselves retaining more water. If you’ve ever woken up in the morning wondering why your face looks puffy, apparently, this is why. 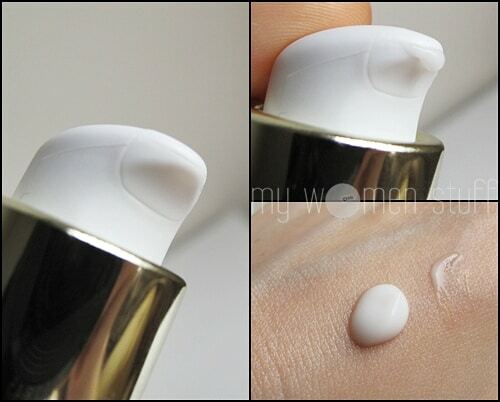 Smooth the serum between your hands (there’s a light scent) and spread on your face starting from the center outwards. I usually take it down to my neck too. The serum absorbs quite quickly without a sticky feel to the skin. There is a special facial pressure technique shown in the video below which takes about 2 minutes. But, you don’t need to use this technique. The serum does the job itself. Using the technique is supposed to help expedite the process. I first noticed one day that my face looked less “round” and the jowls around my jawline were less pronounced. My jawline looked a little more defined too. Having to take pictures of yourself for FOTD pictures does make you a little more observant. The difference was hard to show in photos because its not all THAT noticeable. But if you look at the “Before” you will see that the line of my face is pretty smooth – not much definition. If you are going “I don’t see any difference!” well I did tell you its hard to show in photos because its not drastic 😛 It certainly did not turn my “moon face” into a “kuaci” (melon seed) face. Its now about a month since I started using this serum. The skin on my face feels firmer and less slack around the jawline and I don’t get a puffy face in the mornings. My jawline is also a little more defined. Its all very minimal and subtle and whatever “facial slimming” seems to have stopped. I’m realistic so I’m not expecting to lose it all. Genetics is too strong for a mere serum to overcome. Cons: Pricey product but if it works for you that’s great! Let’s be honest. We don’t all need this. But if you have been trying to find something for this very purpose, you could very well give this one a shot 🙂 Might you? The Clarins Shaping Facial Lift Serum retails at RM225/50ml at all Clarins counters. NEXT POST: Lucas’ PaPaw Ointment : The Best Treatment for Lips and Dry Skin! wow something from Clarins Skin Care actually works. very very very interesting! LOVE this review! i use this too!i have seriously puffy face with water retention. it really works! i was a skeptic but my friend and sister kept nagging at me to use it because they swear by it. I can seriously tell the difference within the first bottle. I am into my 3rd bottle now! Wow! That’s dedication. Glad to hear that it works for you! I have the older version. My face really showed a V at recent photos. But I am also exercising more. So, not exactly sure if all or most of the results is due to the product. Oh by the way, Paris, what do you think of the Beauty Flash Balm, have you tried it? i have a fat face. must try! but scared will break out. At first, I was a bit sceptical about it as I just turned 20 a few months ago and I have really really oily skin that you would think that I had jumped into a sea of oil. And I’m not even kidding. After 2 weeks, my skins had reduced shininess and oiliness. My pores also got smaller and my skin’s tone got more even. I was pleasantly surprised because I have only been applying the product once every day before I hit the sack. I have used this product for about two months. I wish i could post my before after pics but this is the best product that worked well in my face and neck area. I have purchased with evening product ( i guess it was the old one) along with mask. But i have not used the wrap mask often. I got amazing results and i have used every time one pump morning and night. I know it is little pricey but definatly worth it!